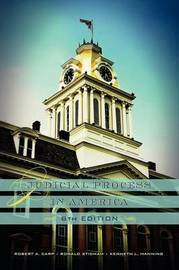 The eighth edition of Judicial Process in America gives a thorough overview of the American judiciary at every level, paying particular attention to the link between the courts, public policy, and the political environment. In addition to comprehensive updates on such topics as the role of the courts in the war on terror, affirmative action, and business regulation, notable additions to this eighth edition include discussion of: * the probable impact that President Obama will have on the composition of the federal judiciary and on subsequent judicial "output" * the highly conservative impact that former President Bush had on the federal judiciary; * Justice Sonia Sotomayor's appointment, as well as Chief Justice John Roberts's leadership on the Supreme Court; * the role the courts are playing in the policy realm of same-gender marriages and discrimination based on sexual orientation; * more comparative references and examples throughout the book. Adopters and students alike will also appreciate the new websites that the authors added to the end-of-chapter suggested resources, as well as the unique annotated U.S. Constitution found in the appendix. This extensive revision of a classic text brings new life to a standard-bearer for judicial process classes.